Teething rash is drool rash. Teething in babies is quite often followed by drool rash. Understanding the teething process can make us realize the basic cause of the associated drool rash. Tooth buds appear on both the arches (jaws) when the fetus is about eight weeks old. They keep on growing inside the gum. A newborn already has primary teeth growing inside the gums. As the teeth grow, the gums swell and become sensitive and painful. Due to the gum irritation the baby may start drooling a lot. The baby may develop rash around the mouth and other areas like chin, cheeks, neck and chest, which are constantly wet with saliva. Generally when the baby is about six months old, the teething commences and usually the lower central incisors start emerging out of the gums. The drool rash should not be confused with eczema or diaper inflammation. Diaper rash typically appears on the diaper area as prickly red spots. The inflammation may become severe and may spread to baby's buttocks, tummy and thighs. It is usually triggered by moisture and wetness in the diaper area. Bacterial growth on the remnants of urine or stool leads to the skin inflammation. Frequent changing of diapers and keeping the diaper area dry will help. Eczema (atopic dermatitis) causes red, swollen and itchy inflammation of the skin. Eczema may flare-up in affected babies when they are teething. The cause of the inflammation is excessive drooling. As there is excessive salivation, the area around the mouth becomes constantly moist. Babies may drool even while sleeping. The saliva soaked skin becomes chapped and gives rise to inflammation. Opportunistic bacteria and fungi may start growing on the inflamed skin and worsen the drool rash. The saliva may get spread on to the baby's cheeks. The saliva may also drip on to the chin, neck and chest and cause rash in all these areas. To control and stop the rash from spreading the first effort by the parents is to keep the baby's mouth area dry by frequent dabbing with a soft cloth. Care should be taken not to wipe the tender skin as it may get further inflamed. To reduce the salivation the baby may given some cool soother, ring or cloth to chew on. A bib can be placed and changed regularly to keep the neck and chest dry and clean from saliva. Petroleum jelly may be applied on areas of baby's skin likely to get wet in order to keep out the drool and teething rash. Umbilical cord blood stem cells. Loud music and hearing loss. Drool and teething rash on baby's face. The primary teeth or milk teeth are the first set of teeth to develop in infants. The primary teeth erupt and become visible in the mouth typically when the baby is about six months old. There are many exceptions, and teething in some babies may be delayed and start as late as 18th month. Some infants may be born with natal teeth and in some teething may start in the first month itself. In general, the primary teeth start erupting by about sixth month of age. It may take 30-36 months for the completion of eruption of all the primary dentition. In total, twenty milk teeth are formed, ten on the maxilla and ten on the mandible. The primary dentition is made up of two central incisors, two lateral incisors, two canines and two first molars and two second molars on each jaw. The child starts losing the milk teeth by the 6th year to be replaced by permanent dentition. The falling of primary dentition and their replacement may go on till 12-13 years of age. The primary dentition start developing during the pregnancy. 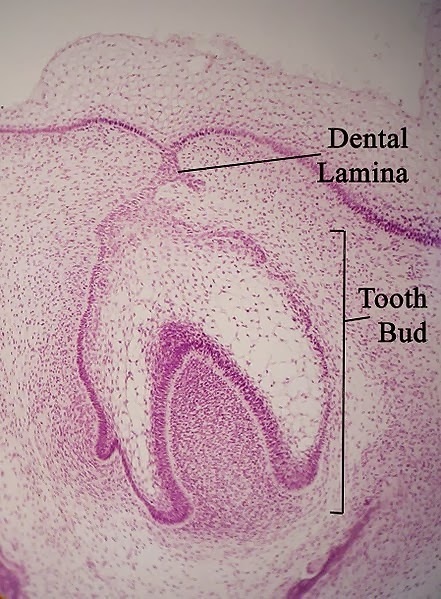 When the human embryo reaches sixth week of development, dental lamina is formed as an in-growth of oral ectoderm. The process starts in the midline and spreads to posterior region. By the time the fetus reaches eight weeks stage, ten dental buds are formed on the upper arches as well as the lower arches. These dental buds keep developing inside the gums and by the sixth month erupt out of the gums. Generally, the mandibular central incisors are the first milk teeth to appear. The maxillary second molars are the last to erupt. Calcium, phosphorus, vitamin A, vitamin C and vitamin D are essential nutrients for the proper development of healthy dentition. Dental enamel and dentin are composed of hydroxyapatite crystals and calcium and phosphorus are needed for their proper formation. Vitamin D regulates the availability of calcium. The deficiency of these minerals and vitamin D may result in less mineralization of hard structures. Keratin and collagen are required in the developmental process. Vitamin A is necessary for keratin formation and vitamin c is essential collagen synthesis. The deficiency of vitamin A may affect enamel formation. Fluoride makes the structure resistant to demineralization and caries formation by getting incorporated into the developing hard tissues. Excess of fluoride during teeth development can lead to fluorosis. The central incisors erupt by 6-12 months and the lateral incisors emerge by 9-16 months. The mandibular incisors appear earlier than their maxillary counterparts. First molars emerge by 12-20 months and second molars emerge by 22-36 months. The canines appear by 15-24 months of age. The appearance of milk teeth and their proper development is very important for the development of buccal cavity. The permanent dentition develop from the same dental germ. The development of the skill of chewing of food and speech require functional primary dentition. The jaw bones and muscles depend upon the milk teeth for developing proper dimensions and form of the dental arches for the emergence of permanent dentition. Early loss of primary incisors usually does not have effect on the later dentition. However the early loss of primary canines or primary molars may result in space loss for the permanent dentition. Though the internal anatomy is similar, the primary and permanent dentition differ in many aspects. The permanent dentition is larger in size. Premolars are present in the permanent dentition. The enamel in the primary dentition is less mineralized, thinner and more translucent. Due to thin layer of enamel caries can form easily. The pulp chambers are large and the roots small and narrow in primary dentition. The primary dentition is temporary and falls off to give place for the permanent one. The sooner we start cleaning infant’s milk teeth, the better. Gums and milk teeth may be wiped clean with a clean warm soft moist cloth after feeds. Depending upon the number of erupted milk dentition, the baby may be introduced to daily brushing by 12-18 months of age. By the age of 2 years a visit to a dentist is recommended to know the health status of the primary dentition. The caries formed in the milk teeth may affect the health of the permanent dentition. Poor oral hygiene is the root cause of caries formation. Infants tend to fall asleep while breast-feeding or bottle-feeding. The last mouthful of milk may remain in the mouth if they were feeding in the lying position. The milk may decay and caries may develop. To prevent teeth decaying and also infections of the eustachian tubes and ear, infant's head must be at a higher elevation than the throat while feeding milk. It prevents milk from staying back in the mouth even if the baby falls asleep whilst feeding. Symptoms of pneumonia in children. 1.Alexander K. C. Leung and William Lane M. Robson. Natal teeth: a review. J Natl Med Assoc. 2006 February; 98(2): 226–228. PMCID: PMC2595049. Milk teeth are primary teeth.